Did you guys even realize that payphones are still around? I’ve seen them around the city but they always look broken and I don’t recall the last time I saw someone using one – that is until yesterday. 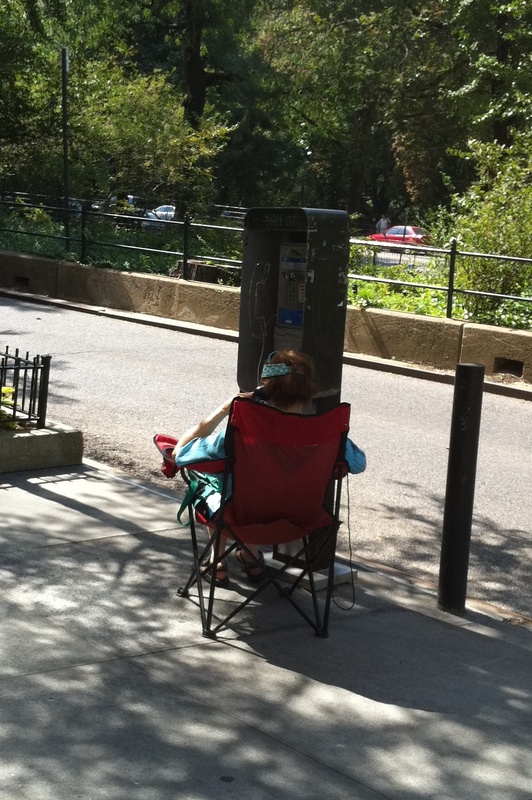 Literally visible from my front door is this payphone that I honestly never noticed was there until I saw this lady camped out making phone calls yesterday afternoon. Not only does she have her camping chair but she also has Tiva’s, a visor, sunglasses and her address book. She must have been there a while because I went into my building while she was talking on the phone and when I walked by again 15 minutes later she was still on the phone. She should look into a cell phone, or at least a land line.